Image | This entry was posted in Politics, U.S.A. and tagged Barack Obama, General Motors, GM, GOP, housing market, jobs, Republican Party, right wing lies, stock market. Bookmark the permalink. Obama is pro business for his political contributors. It is simple. Donate money and get a Federal grant or other “help” from government. 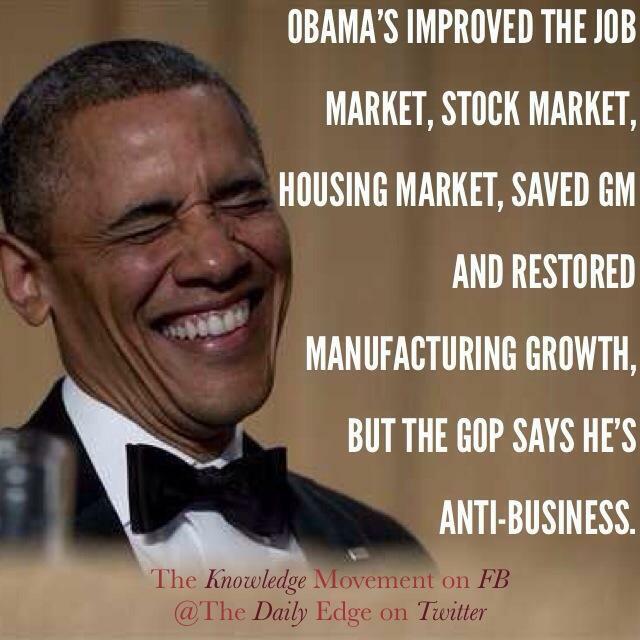 I think it is called “Crony Capitalism.” That is what he really is. As to being really pro-business, keep on collecting your food stamps and telling yourself that. Great Alternative Reality. Guess ignorance, hate and dishonesty have been inbred in you. There are no alternative realities. There is only reality. The truth is true and nothing else is true. That is a pretty racist remark, the idea that ideas are “inbred” in people. You are certainly one of those ignorant Conservatives I hear about, the ons that Rush Limbaugh and Fox News prey upon and indoctrinate. No wonder America is sinking into the Third World.